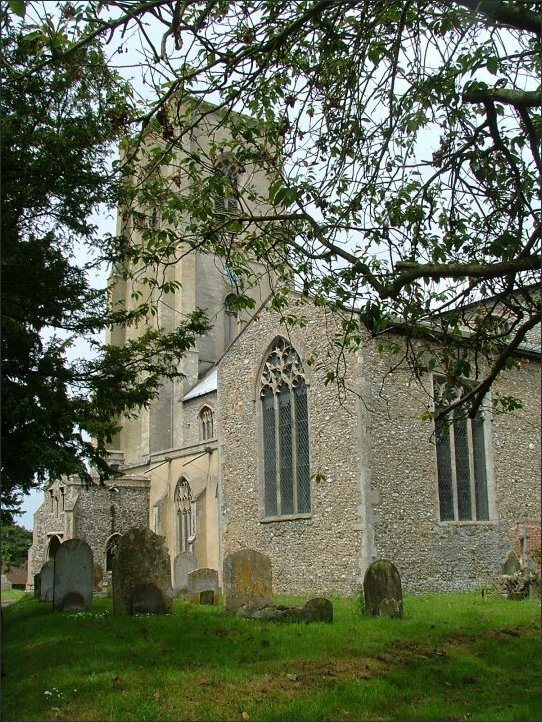 Cawston is a surprisingly large village, both because it is in this area of narrow lanes and remote churches, and also because it it so close to the larger village of Reepham. But St Agnes is not a surprise, because you have seen the tower so often already on the horizon, riding the hedgerows, as you weave between the sprawling fields. 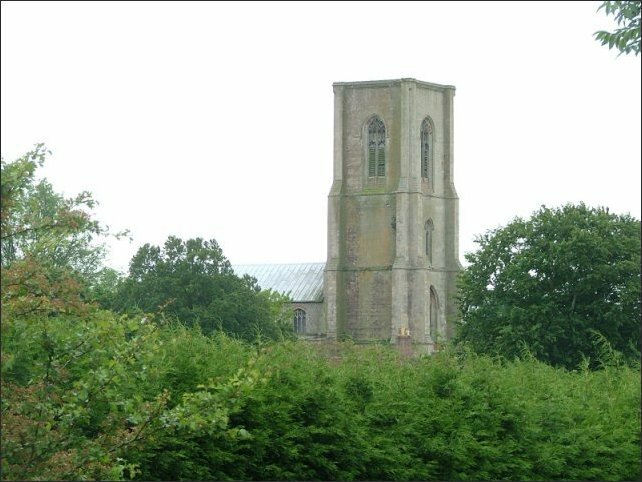 A stark, monolithic object, both because of the unfamiliar stone and because the top is without pinnacles or battlements. 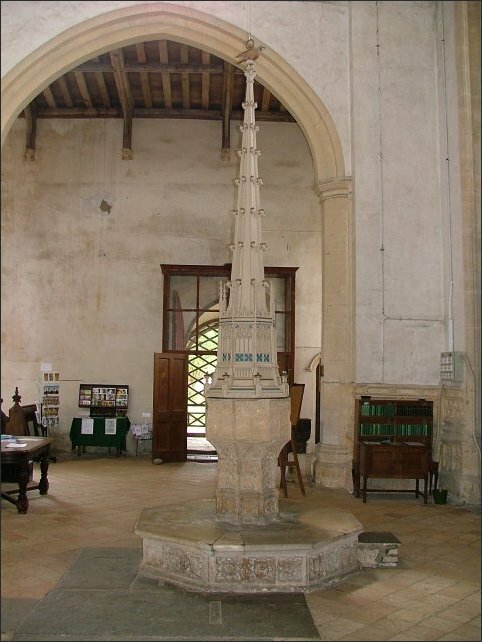 From many places you can see both this tower and that of Salle; but there is never any confusing them. 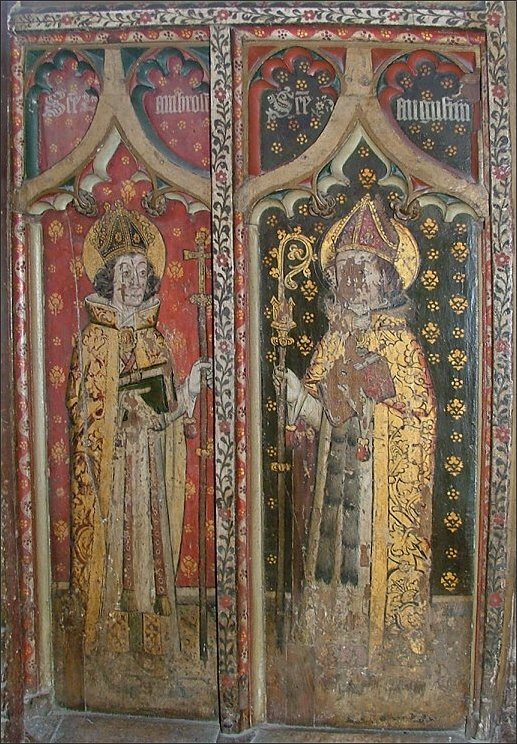 The de la Poles had it built, and it reflects the full confidence of the early years of the 15th century. It provides a taste of things to come in the decades ahead. 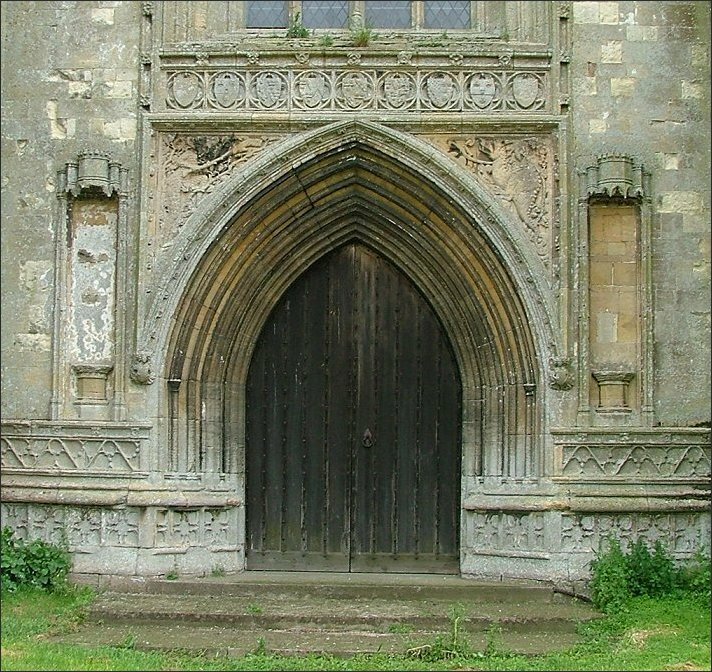 The great west doorway is unfamiliar, sulking solidly, as if the south porch had superceded it, which probably happened. 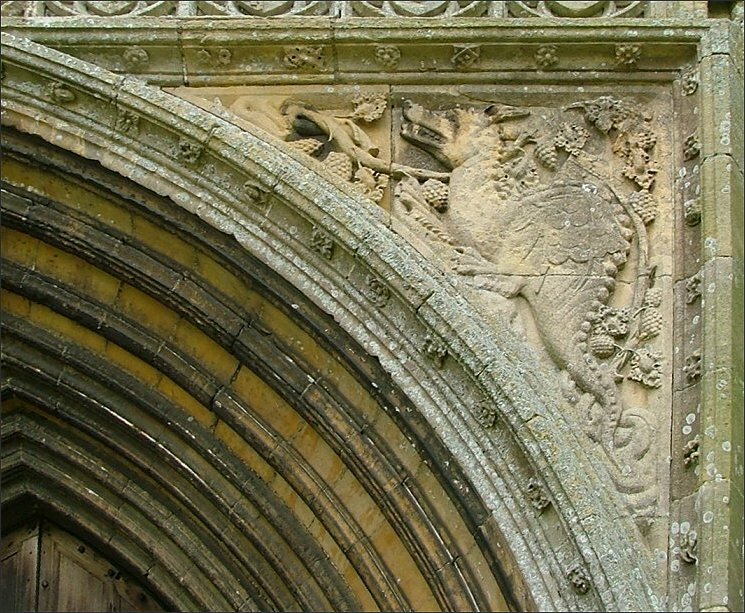 The wild man and dragon in the spandrels are two of the biggest there are. 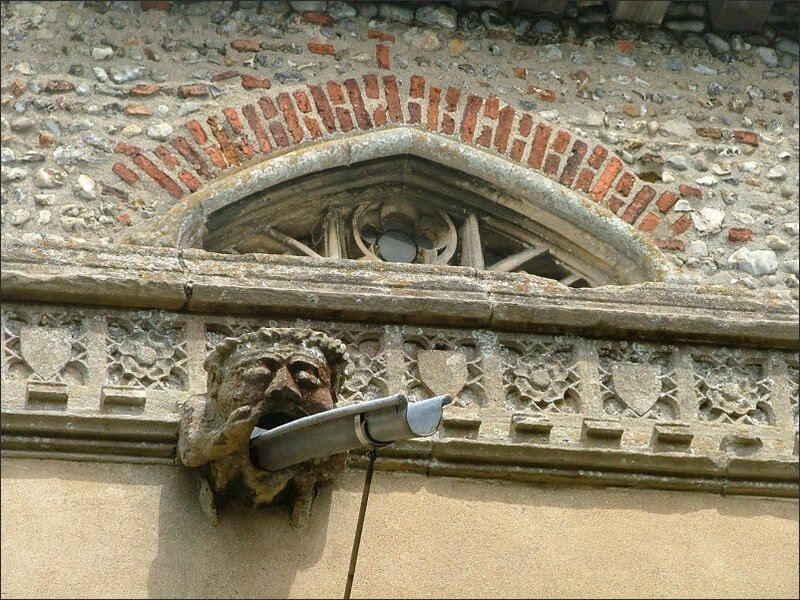 Characterful gargoyles squat below the parapets; the one on the east side of the south porch appears to be carrying a rugby ball. 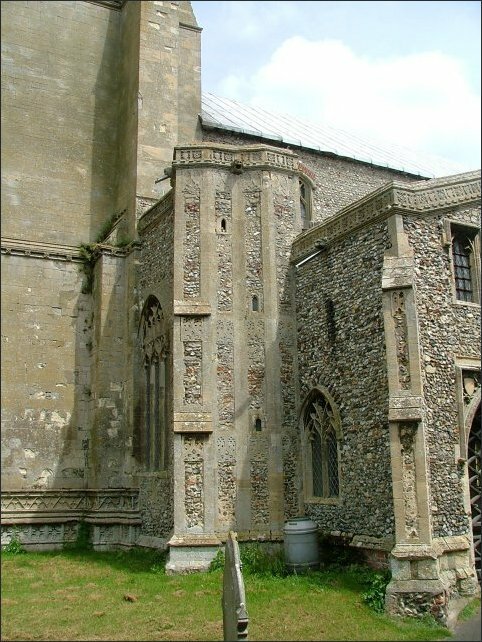 The stair turret to the west of the porch is outstanding, looking as good as if it was built yesterday. The brick outlining to the clerestory is gorgeous. You step inside to a feeling of confidence and strength. This has always been an important church. 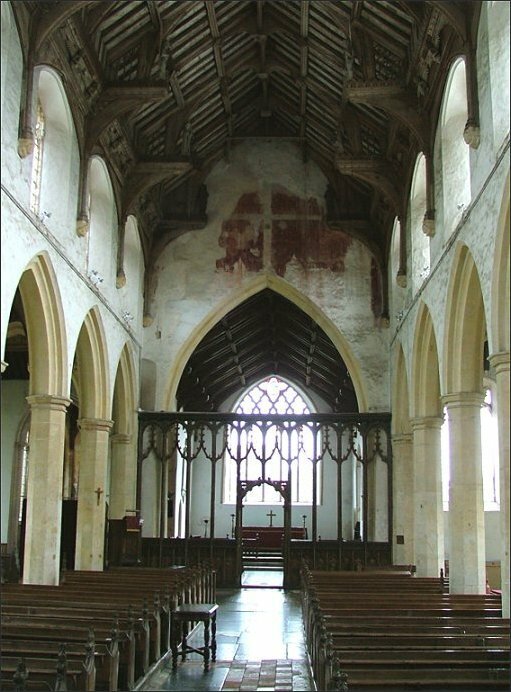 The treasures of the building include one of Norfolk's best rood screens, and some superb medieval glass collected in the south aisle. 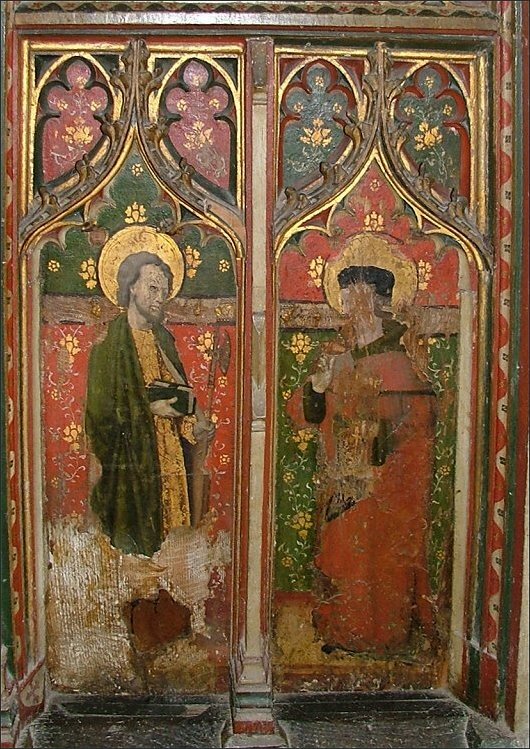 The screen is well-documented as the work of three artists, and depicts, on the north side, from the left, St Agnes and her lamb, St Helena and her cross, St Thomas, St John the Evangelist, St James, St Andrew, St Paul and St Peter. 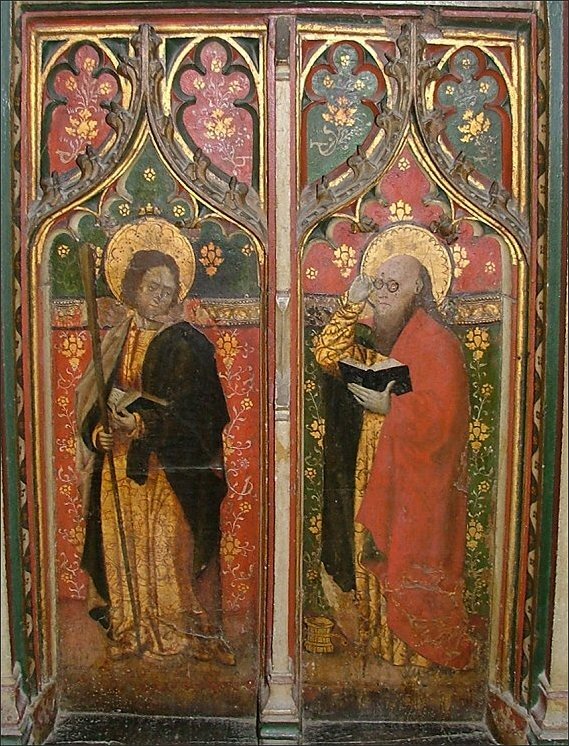 On the gates are St Gregory, St Jerome, St Ambrose and St Augustine. 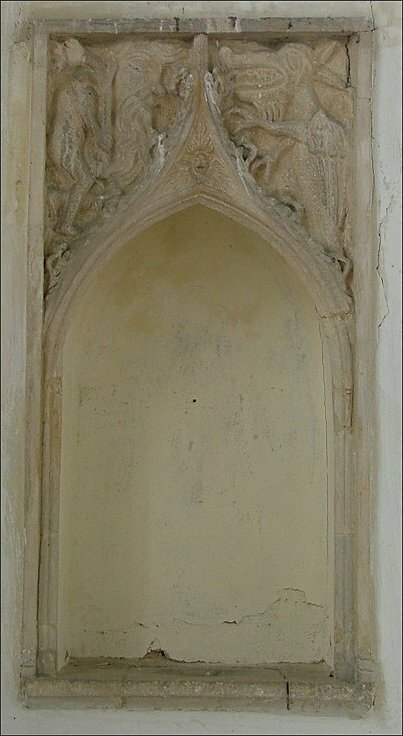 Interestingly, these four doctors of the Church are in the same position at Salle, and are also on the font at nearby Great Witchingham. 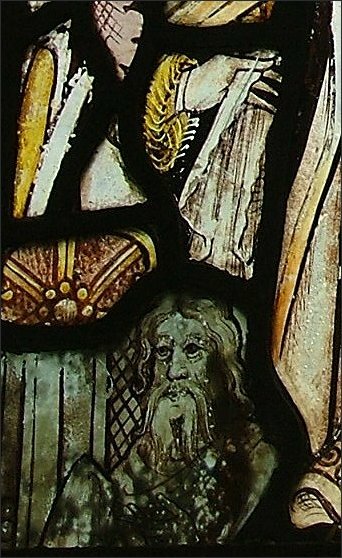 On the south side, the Saints are St James the Less, St Bartholomew, St Philip, St Jude, St Simon, St Matthew famously in his glasses, St Matthias, who appears to be carrying a filofax, and the uncanonised Sir John Schorn conjuring the devil into a boot. 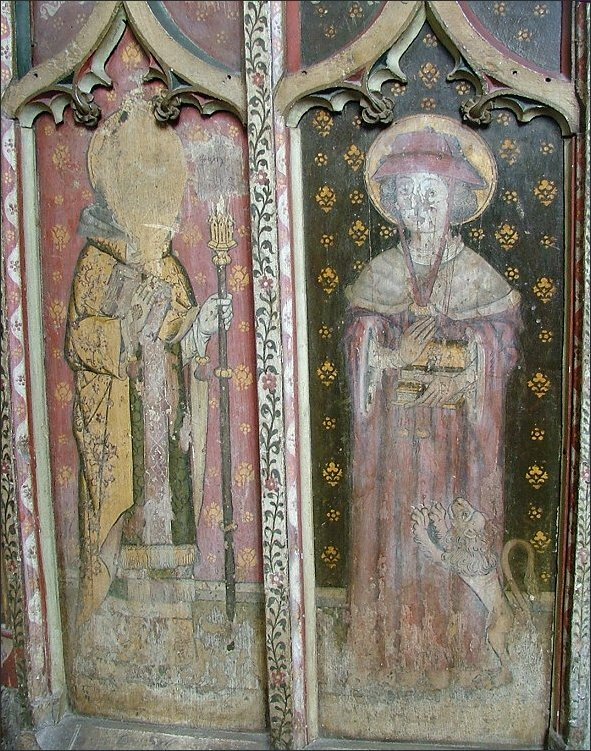 Of these, the last and St Gregory are heavily vandalised, Sir John probably because of superstitious practices associated with him, and St Gregory because of his papal tiara. You can see all the panels below, in order. 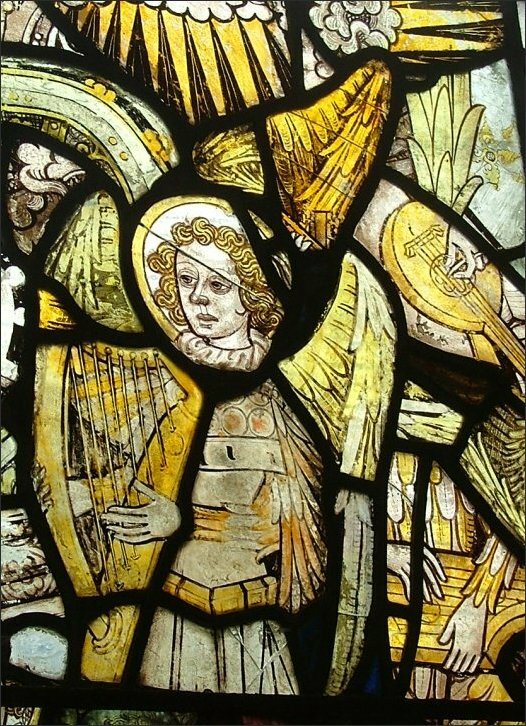 The stained glass has many angels playing instruments, heartbreaking echoes of Norwich St Peter Mancroft and East Harling. 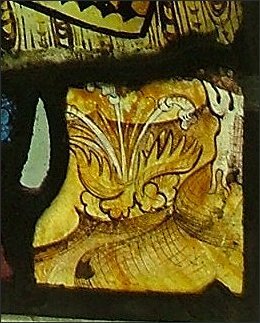 Tom Muckley pointed out to me the tiny detail of an ear of barley, motif of the 15th century Norwich school. 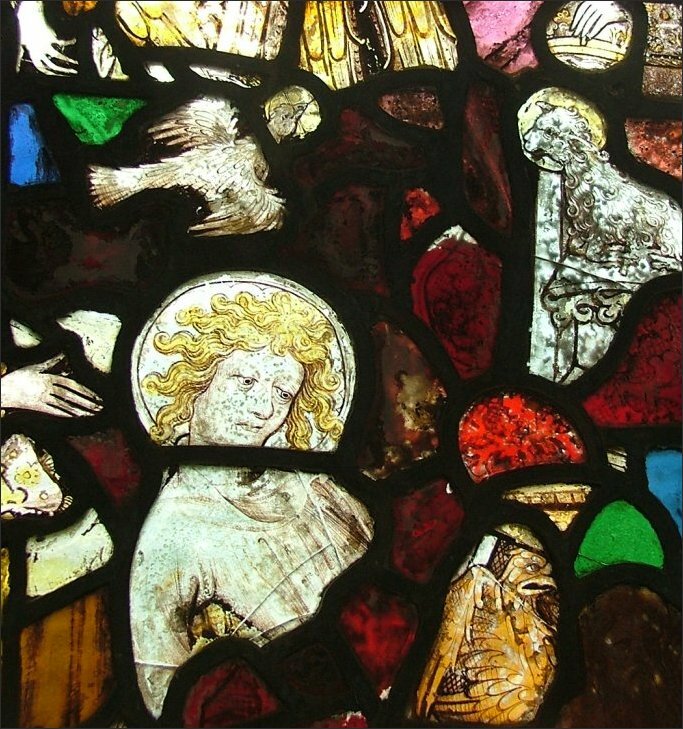 Among the angels are tantalising fragments: St John the Evangelist's eagle, the head of God the father, what is probably the cloth of St Veronica, a dove descending, and so on. 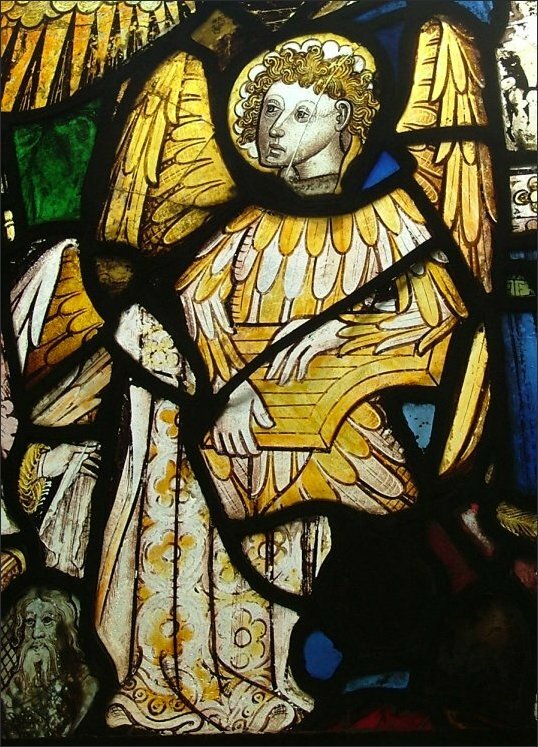 Because of the way they are set in the bottom of a window it is possible to see them, and photograph them, at close quarters. You can see some details below - click on them to enlarge them. 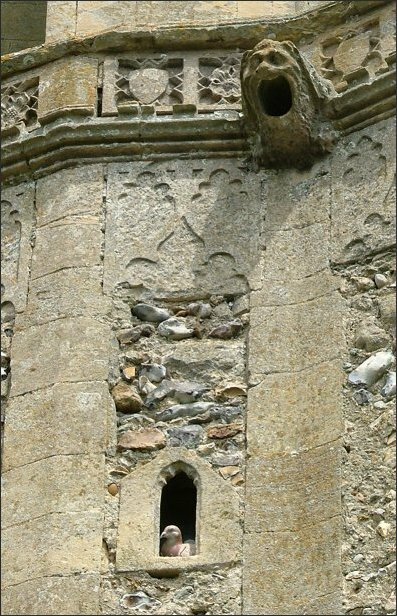 The traceried base courses to the tower continue inside the building, and set in the tower arch is a pretty little gallery which is something quite unusual. 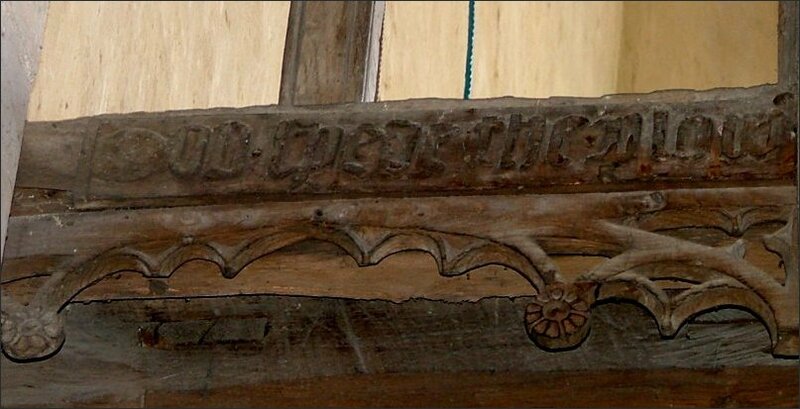 The inscription along the front appears to read: God spede the plow and send us ale corn enow oor purpose for to make: At crow of cok of the plowlete of Sygate: Be mery and glade wat good ale yis work mad. Ale corn is barley, of course, and a goodale was a fundraising celebration held by a guild, in this case the Plough Guild of Sygate. 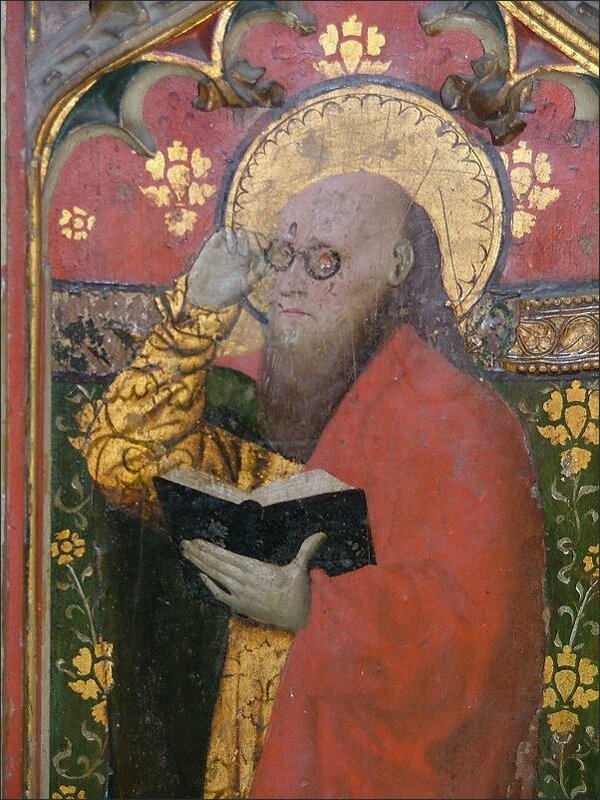 There is a suggestion of a pun in the last phrase, suggesting that Wat Goodale might have been the name of a donor of the church; if you move the colon forward four words, it becomes an injunction to be merry and glad at crow of cok (that is, sunrise) at the Sygate Plough, and then that Wat Goodale yis work mad (this work made). 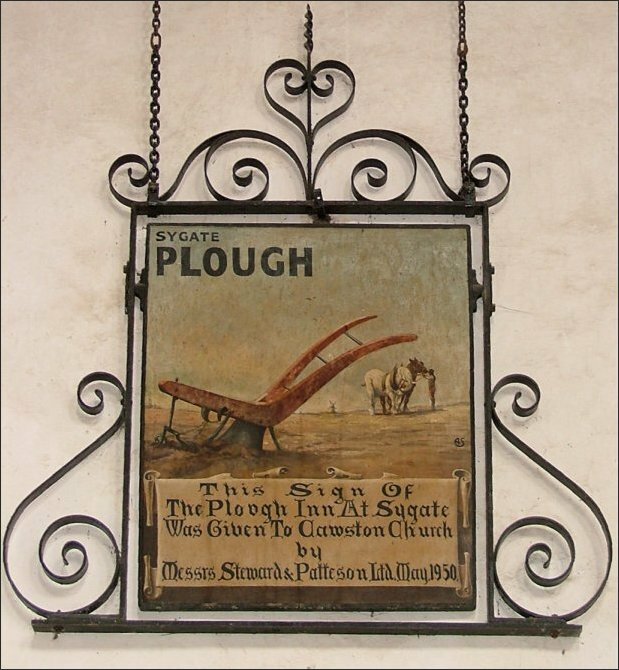 The Plough inn remained in use well into the 20th century, and when it closed in the 1960s the sign was given to the church, and is still on display. 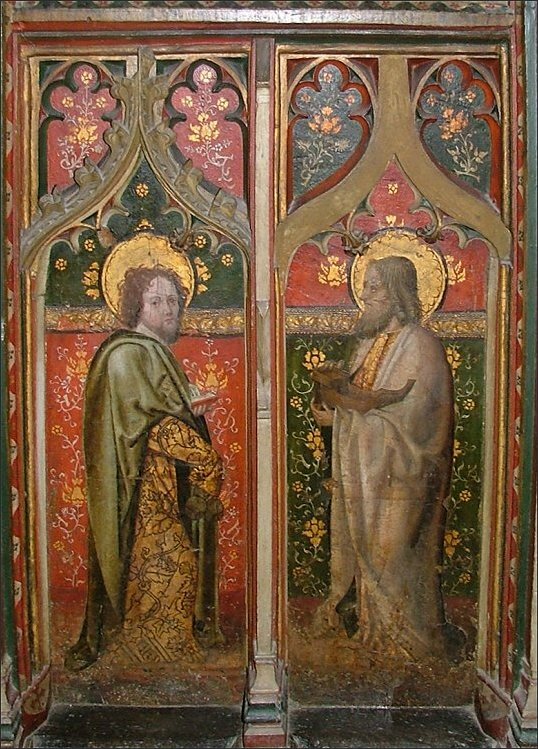 The gallery is commonly referred to as the Plough gallery, although there is no reason to think that the guild had a particular association with this part of the church. 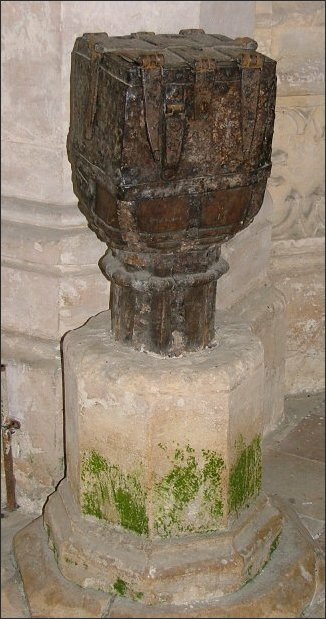 In front of it rises the impressive 15th century font cover, although the font beneath it is surprisingly run of the mill considering the building that contains it. Looking up, the roof is far from commonplace. 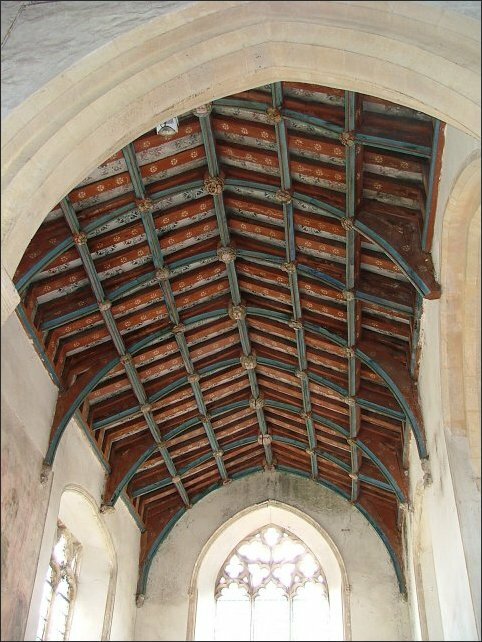 It is one of the best of the East Anglian angel roofs, relatively unrestored and with occasional traces of original colour. 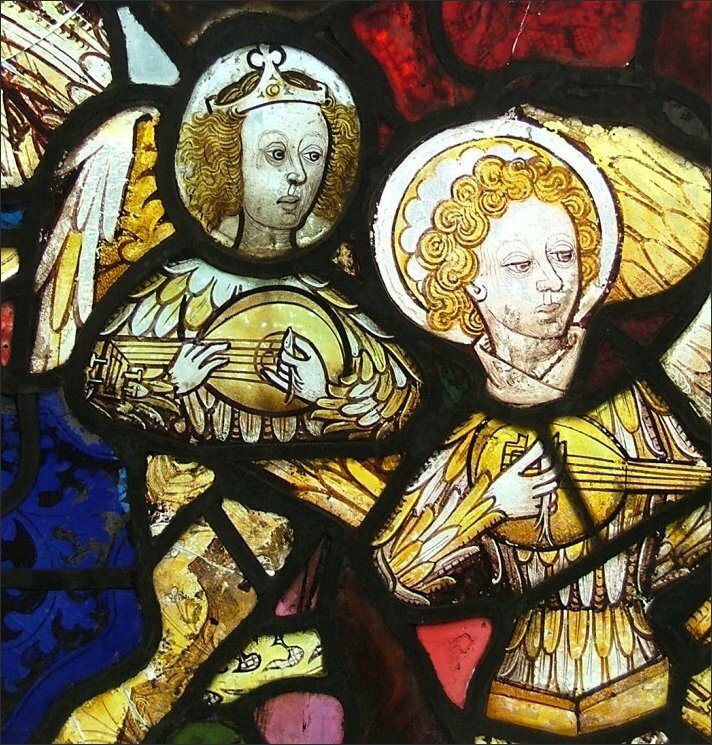 Angels take flight from the wall posts and stand within the hammer beams, although the figures at the east end are not angels. 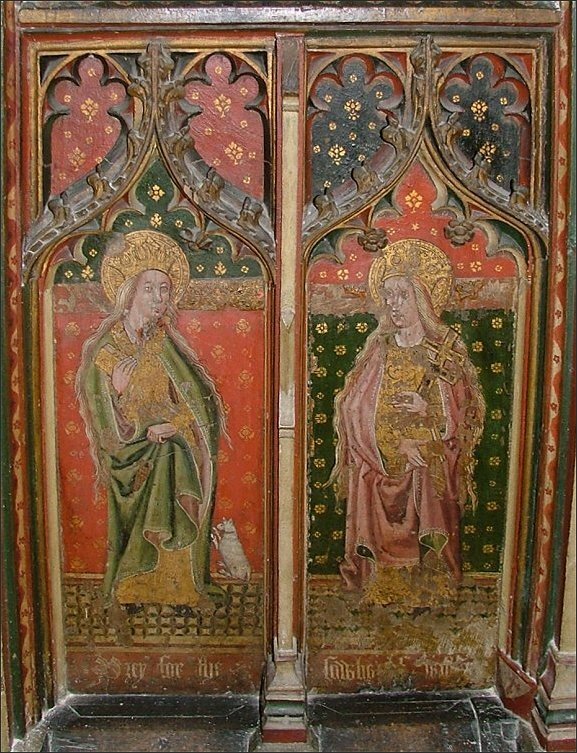 There are three of them, one obviously a woman; perhaps they were figures from an annunciation, although Pevsner inclined to the idea that they were simply 19th century additions. 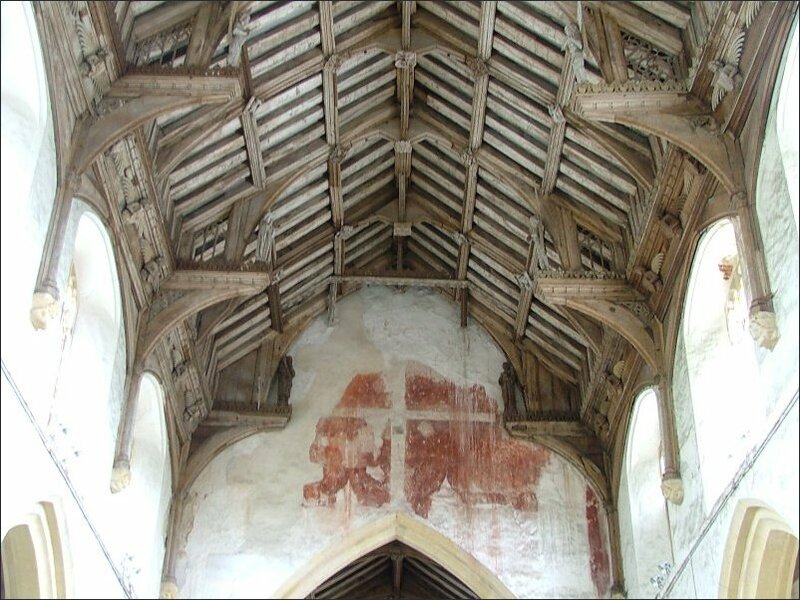 You will be distracted from them in any case by the remains of the doom painting above the chancel arch, including the haunting shapes of the rood figures that stood against it, as at Wenhaston in Suffolk. 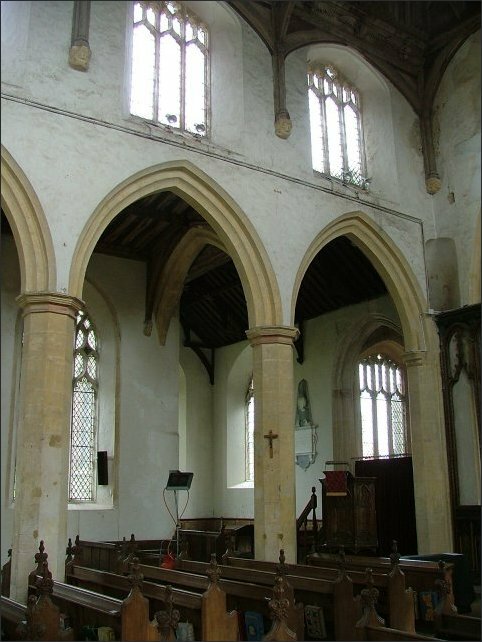 Unusually for East Anglia, but as at Salle, St Agnes has transepts. 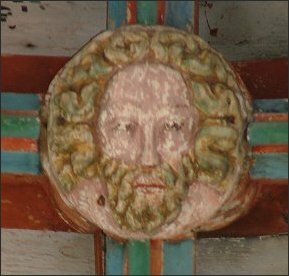 The south transept roof is richly decorated, and punctuated by bosses of faces which may depict donors. 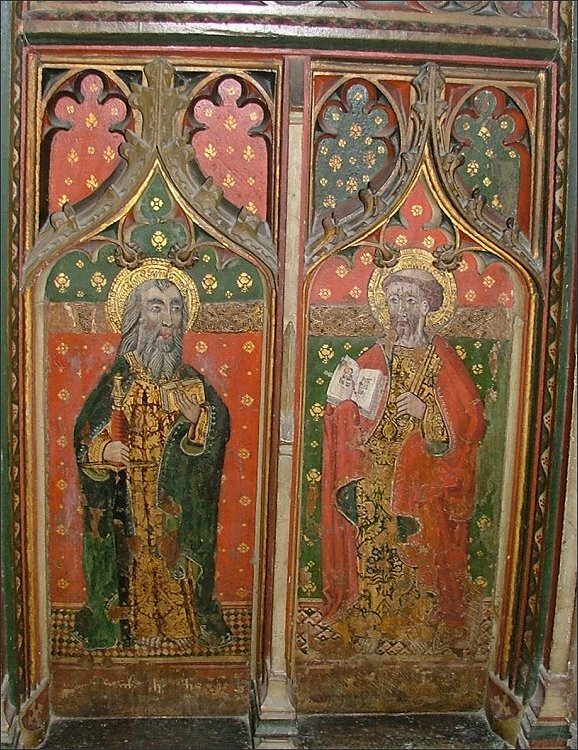 Also probably donors are the two figures either side of the central figure in the important wall painting on the east wall of the transept. 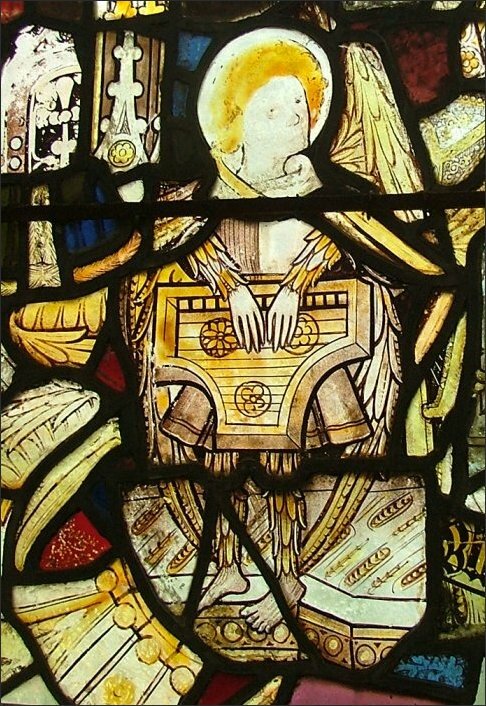 She sits between them on a throne, a book in her left hand. 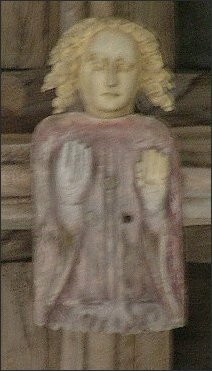 She lifts her other hand in the air, seemingly in benediction, but if you look closely you can see a dove pointed towards it. 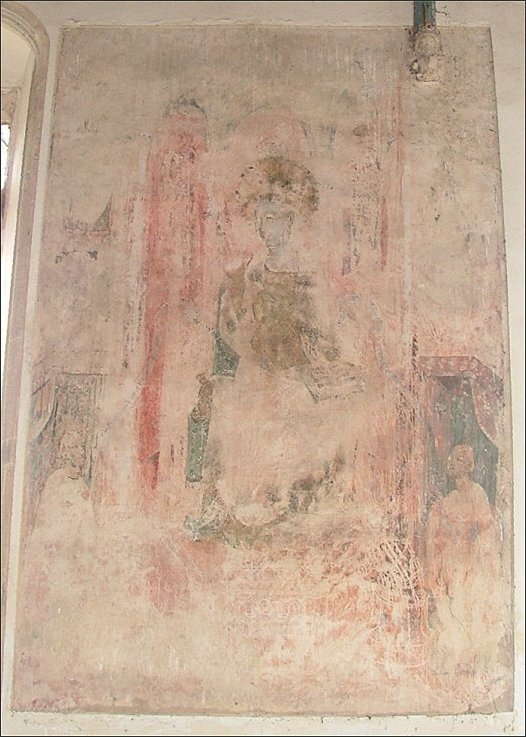 The guidebook suggests that it is Mary, but I do not think this can be the case, since the pose depicts none of the conventional Marian iconography. 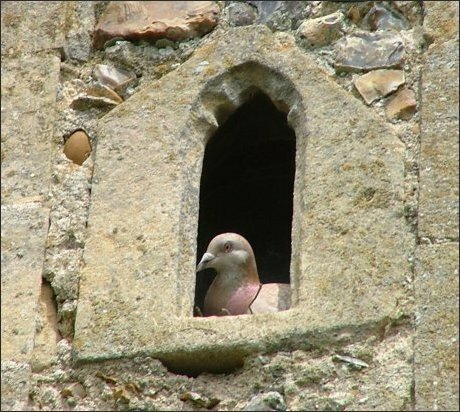 I am inclined to the other view that it is in fact St Agnes, the dove kissing her ring, and that this was probably the chapel of the guild of St Agnes. 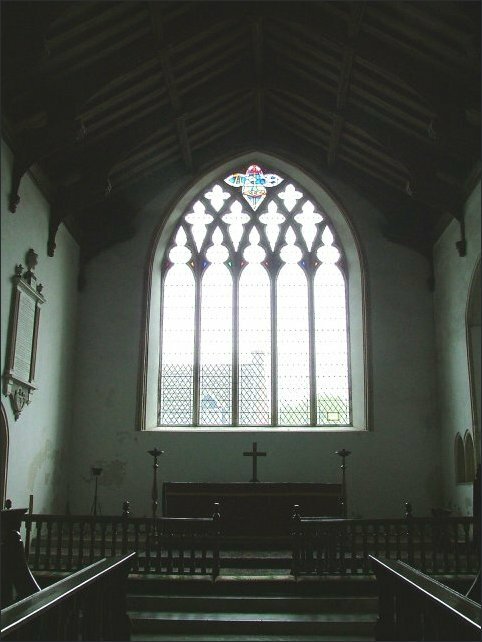 Once, an altar would have sat beneath it, lit in the afternoon by the now blocked window in the west wall opposite. 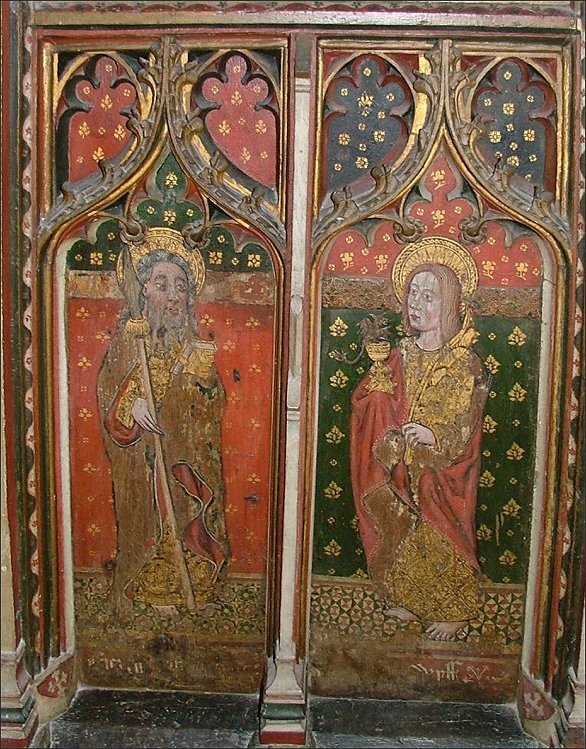 She also appears on the roodscreen, of course, and these taken together with the known existence of a guild support the presumed dedication of the church. 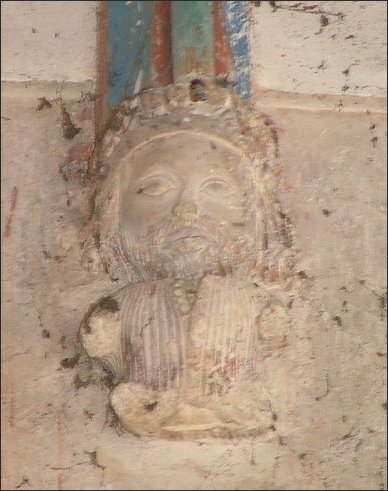 In the south wall of the transept is a very elegant piscina, too far from the painting of St Agnes to have supported an altar there, so there must have been another one here. 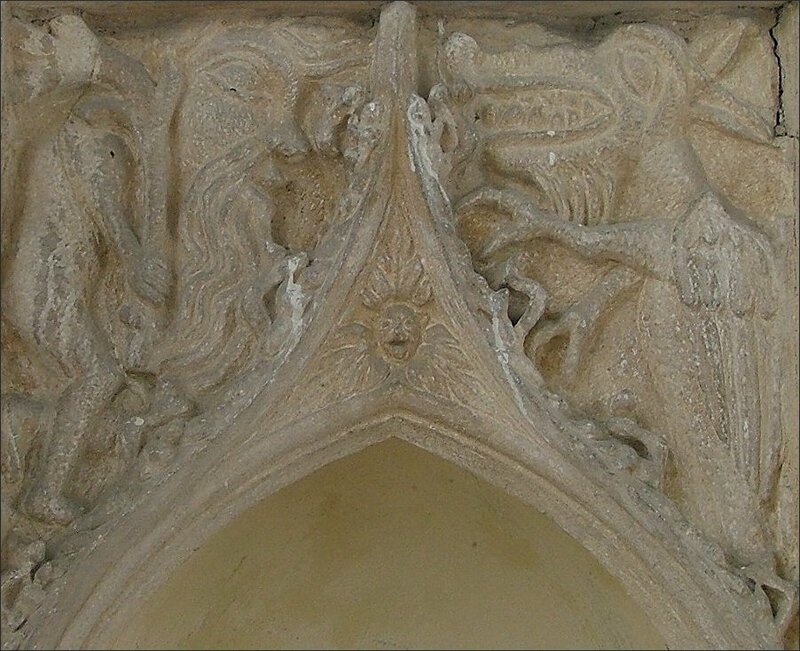 In the spandrils are a wild man and a dragon, echoing, although not repeating, those above the west door. 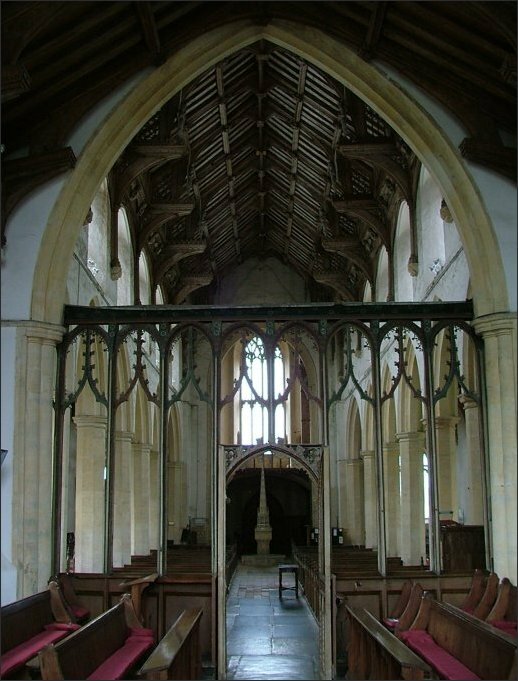 Stepping through the screen, the chancel is simpler and more elegant, reflecting its origins on the other side of the Black Death. 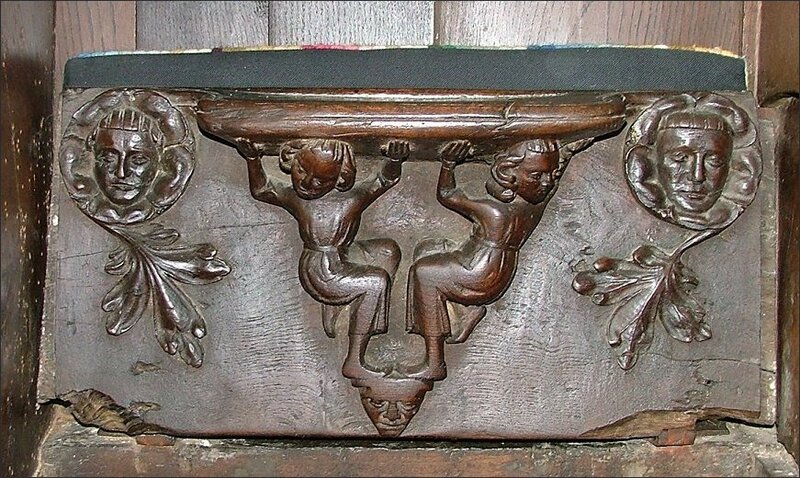 A curious set of three misericord seats has been sandwiched into the gap where the sedilia once was, supported rather awkwardly under the right hand feet. 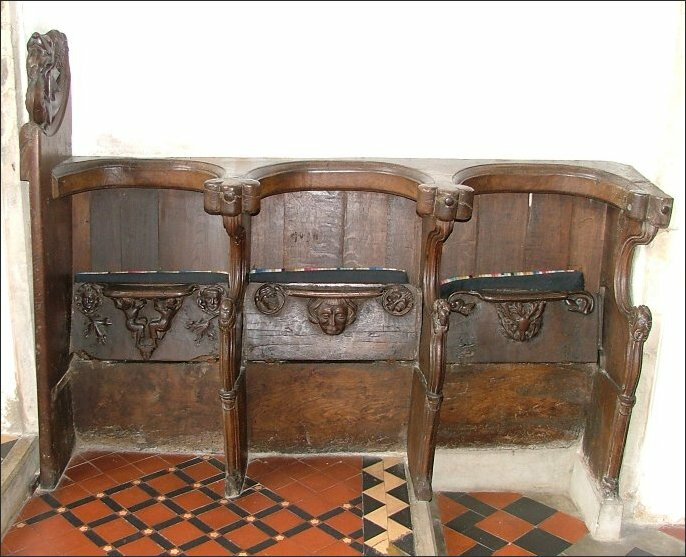 The seats certainly weren't there originally, and may not even have come from this church, but they look very fine now. 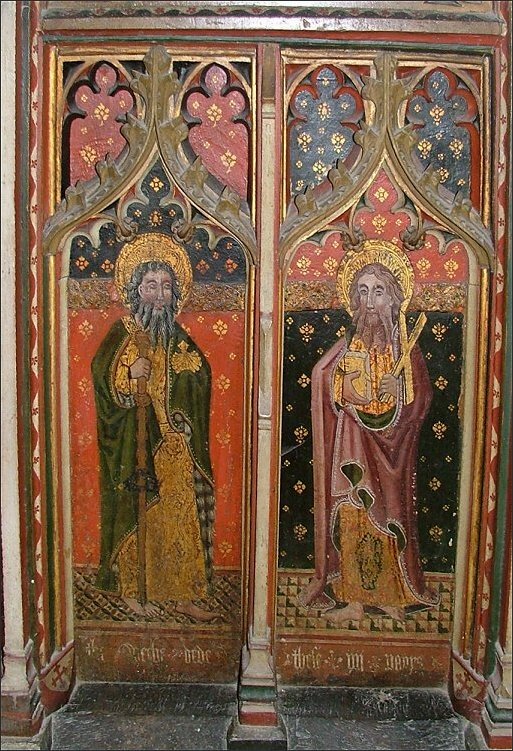 Two seated figures support the left hand seat; there is a comical face in the middle and a stag flanked by two dogs on the right. 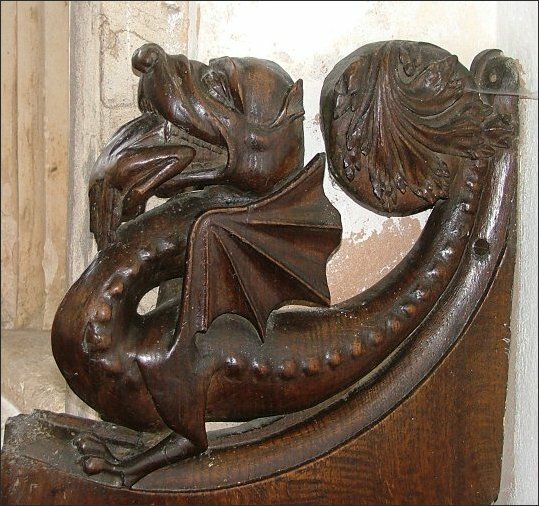 The most curious figure is on the easterly arm; it appears to show a dragon with something in its mouth, a figure perhaps, in which case it might be a rare symbol of St Martha. 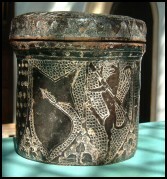 There is no figure on the other arm, suggesting that this set was once one of at least a pair, and stood end-on to a north wall. 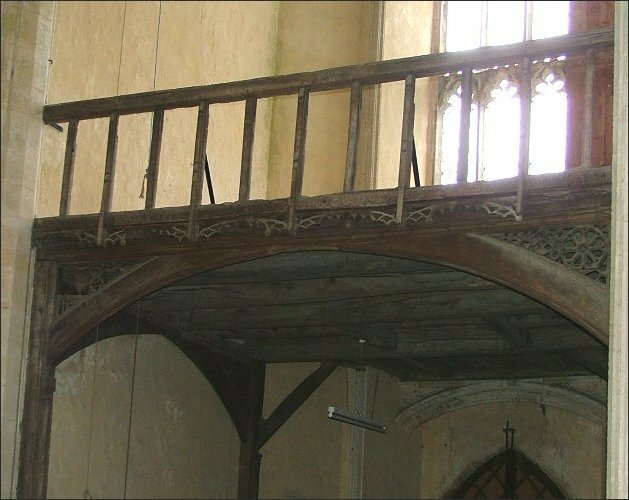 The pulpit is a good 15th century one, a reminder of the emphasis that the pre-Reformation church placed on preaching. 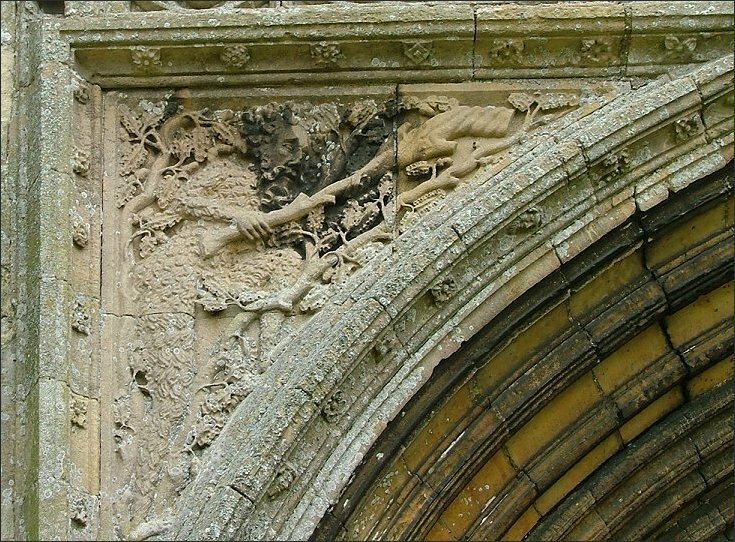 But the oldest object in the building is down by the south door. 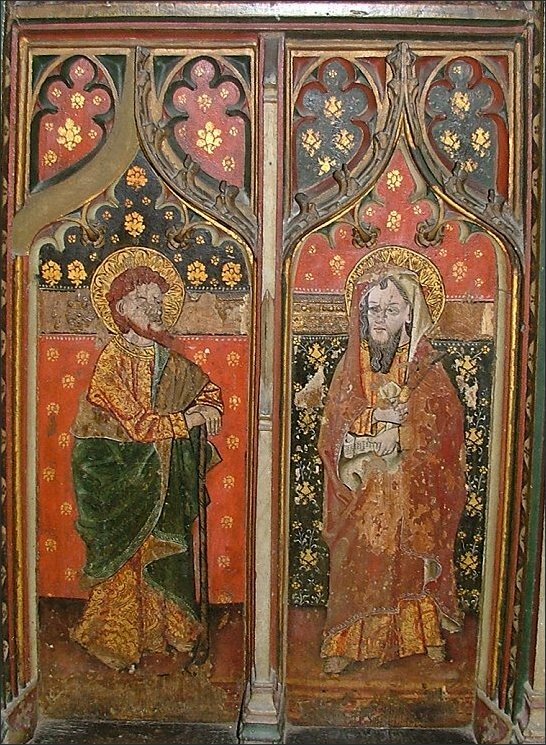 It is an alms box that, in the manner of parish chests, requires three separate keys turned at the same time to open it. 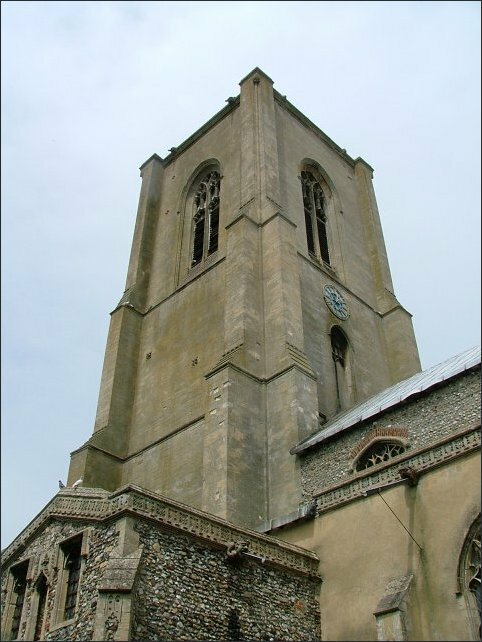 One would be held by the Rector, the others by churchwardens. 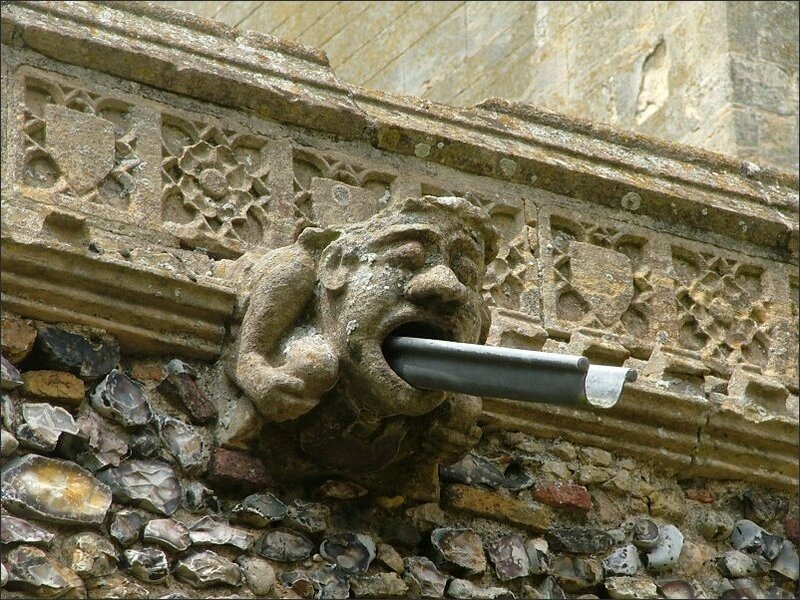 They must have been a suspicious lot here in those days. With two great churches in such close proximity, you feel compelled to pass judgement on which is the finest and the most significant. 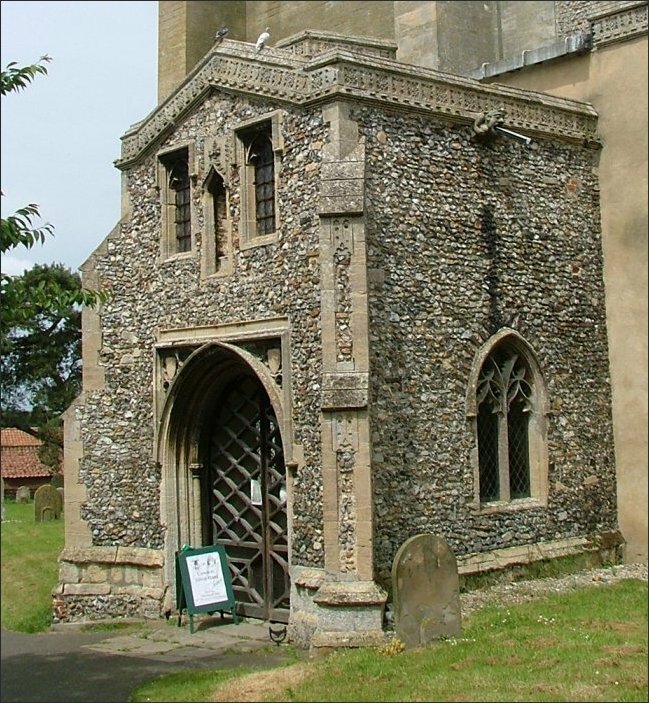 Well, it was only my first visit to either Cawston or Salle, so I didn't really feel in a position to do so. But I did like Cawston best. 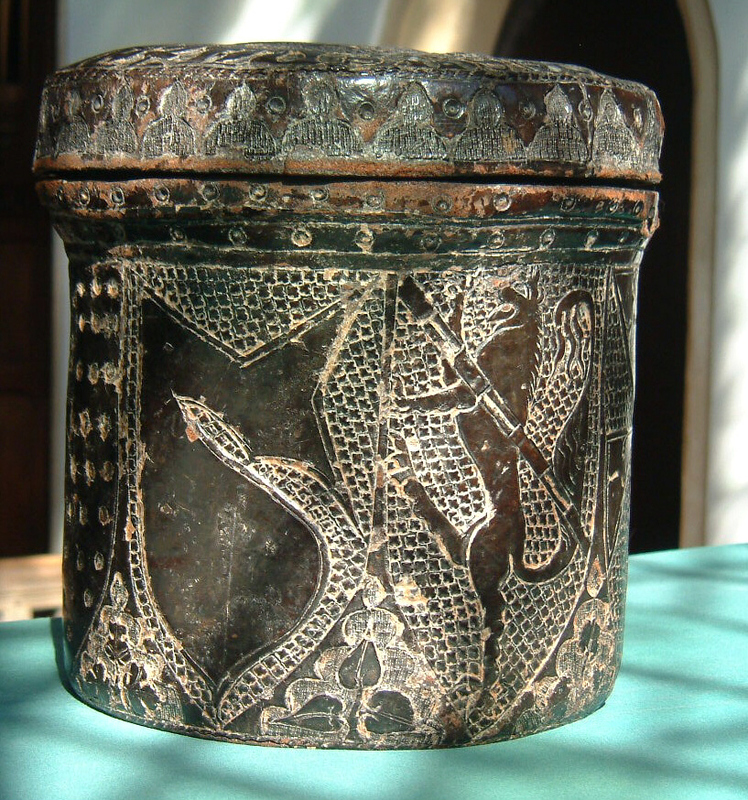 postscript: friend of the site Jeremy Haselock contacted me to tell me about the Cawston pyx case. 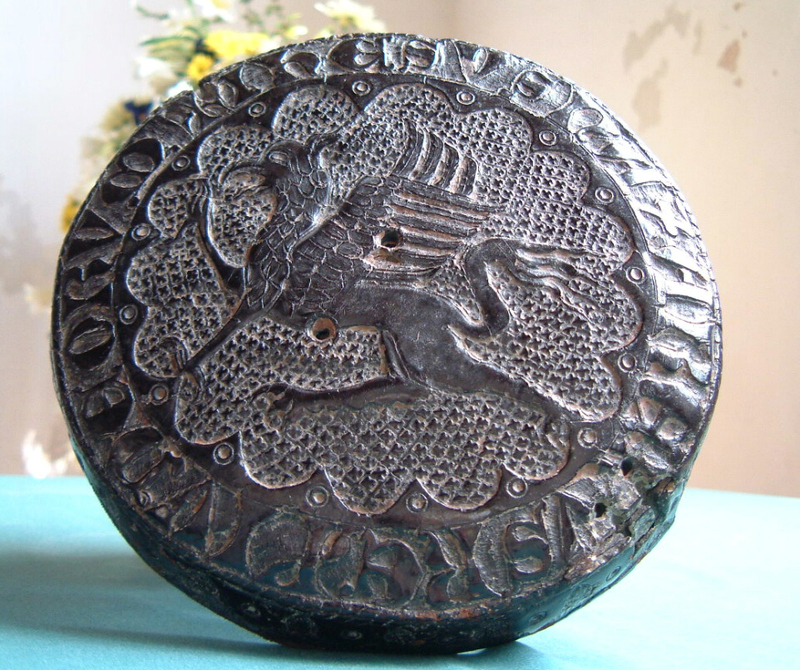 "It is a superb survival of what must have been a typical piece of kit in a decent pre-Reformation church", he explains. 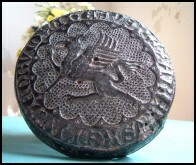 "It is a tooled leather case made to store or protect a pyx (a vessel to contain the Blessed Sacrament) when not in use. 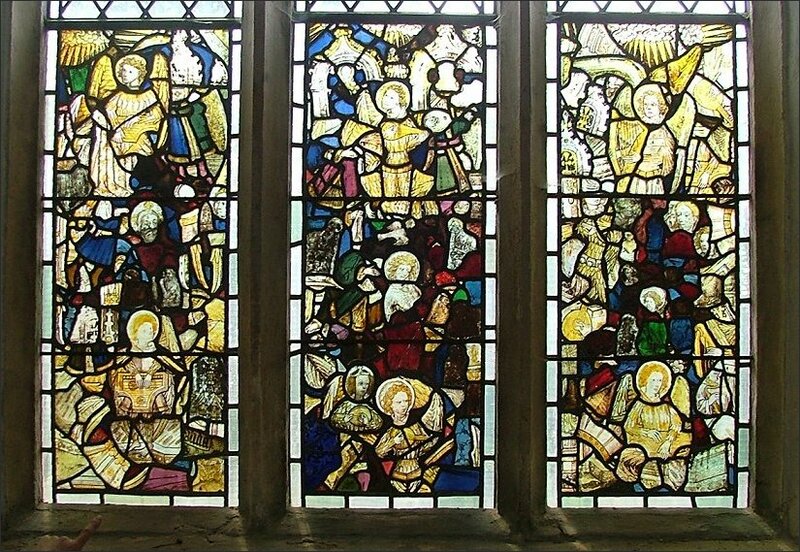 I think it is late 14th or early 15th century in date, but I could not swear to that." 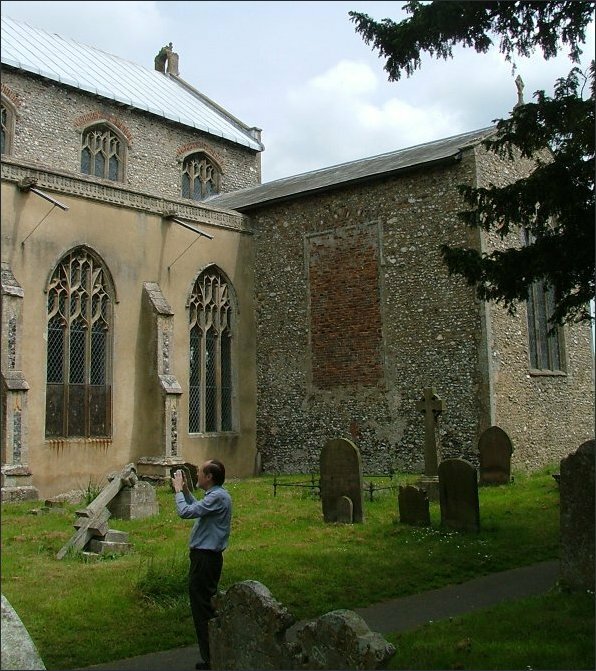 Jeremy sends two photographs, which I gratefully reproduce below - click on them to see them enlarged.